Microcontrollers were traditionally programmed using assembly code which made interpretation from code to controller simple. Later, compilers and C code were adopted which permitted a more simplified human experience. Most recently, strides have been made toward interfacing between higher level programming languages and microcontrollers, which is geared toward earlier adoption by younger electronics enthusiasts and education situations. Be sure to allow any prompts made by the install. The Mu editor should now be installed. Next, open Mu by navigating from "Programming -> Mu". Since we're using Adafruit's Trinket M0, we want to select 'Adafruit CircuitPython' and start adding code to the editor! If you're seeing the blink pattern above, go back through your uploaded code and find the error or errors. The code used to communicate between the two is shown below. Using an iPhone BLE App (I use this one). The code above turns the onboard LED on when the HM-10 receives a '1' and turns the LED off when it receives a '0'. A video of this process is shown below with the BLE 4.0 App. In this tutorial I outlined how to use the hugely popular Python programming language to interface with Adafruit's new M0 Trinket microcontroller. 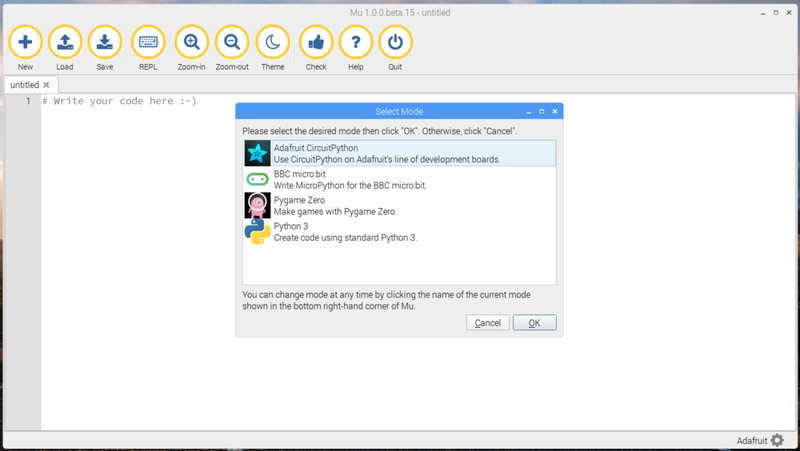 The platform, called CircuitPython, makes it easy to interface with powerful microcontrollers using the high-level easy-to-understand programming language. Using only a few lines demonstrated above, one can tranform a powerful, inexpensive microcontroller into a wireless Bluetooth-enabled smart device, all while being only slightly larger than a quarter.